Born on November 7, 1913, in a small coastal town formerly known as Mondovi (now Drean) in French Algeria, Albert Camus was an influential French philosopher, writer, essayist and journalist. Due to his renowned philosophical essay – The Myth of Sisyphus – published in 1942, Camus is considered one of the most prominent personalities of the philosophical school of thought known as “absurdism,” which has developed into a fundamental belief system based on the European existentialist philosophy in the early 20th century. Albert Camus was born to semi-proletarian and Pied-Noir parents (French citizens who lived in French Algeria before its independence). His father, Lucien Camus, was a vineyard worker who was killed in 1914 in the Battle of the Marne during World War I. After his father died, Camus grew up in Belcourt, the poorest neighborhood of Algiers, with his half-deaf and taciturn mother, Catherine Sintes, who was from Majorca, Spain. Also in the household was his older brother, Lucien, his grandmother, and a disabled uncle. Camus attended the University of Algiers where he was also a goalkeeper for Racing-Universitaire, the university’s football team, from 1928 until 1930, when he came down with tuberculosis. He studied with Paul Mathieu and French philosopher Jean Grenier, who also became one of his closest friends and to whom he dedicated the famous essays Betwixt and Between (L’Envers et L’Endroit) and The Rebel (L’Homme Revolte). Afterwards, Camus moved to the house of a wealthy uncle and then he lived in different neighborhoods of Algiers, taking various jobs and leading an independent life. In 1934, when he also adhered to the Communist Party, he got married, only to separate from his wife a year later. In 1935, he founded the Worker’s Theatre (Le Theatre du Travail) and between 1936 and 1937, he worked as an actor for the theatre troupe Radio Algiers. In 1938, he was an editor for the Algerian newspaper Alger Republicain, which was run by Pascal Pia, to whom Albert Camus dedicated The Myth of Sisyphus. In 1940, he got married to Francine Faure, a mathematician and pianist. He then left French Algeria and moved to Lyon, France. Camus’ fundamental philosophical thought represents an eternal oscillation between “yes” and “no” simultaneously (even one of his essays is entitled Between Yes and No (Entre Oui et Non). This was an attempt to address the reconciliation of the contraries, incessantly aspiring towards a balance or a unity between the human conscience itself and the world which is never fully attained. Because the human condition intrinsically involves mortality, Camus believed that people should fully appreciate life, light, and happiness. In The Myth, he explored this dualism and turns it into a paradox in which humans attribute value to their lives while being fully aware of their mortal condition. He said that in order to appreciate life, an individual must be honest with himself and his life must have a meaning. Thus, according to Albert Camus, being honest means “agreeing with yourself.” This agreement must be able to give meaning to life and to constitute alone the guarantee of happiness. Camus was the proponent of living each moment in one’s life with lucidity. In the Sisyphus perspective of a lack of hope, Camus’ philosophical belief involved a tragic humanism, man’s victory in each moment of his life is at the same time a defeat. 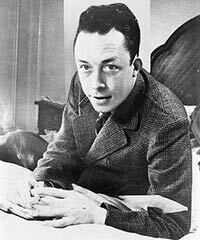 Albert Camus was the second youngest recipient of the Nobel Prize for Literature (after Rudyard Kipling). He received the award in 1957 for his significant literary work that explored the problems regarding the human conscience. Albert Camus died at the age of 46 on January 4, 1960, in a fatal car accident in Sens, near Villeblevin in Burgundy, France. He was buried in Lourmarin, France. He was survived by his twins, daughter Catherine and son Jean Camus, born on September 5, 1945, as well as by his wife, Francine.